Spanish and U.S. Marines march together in a change of command ceremony at Naval Station Rota, Spain in July 2002. Marines, also known as a marine corps or naval infantry, are an infantry force that specializes in the support of naval and army operations at sea and on land, as well as the execution of their own operations. In the majority of countries, the marine force is part of the navy, but it can also be under the army like the Troupes de marine (French Marines) and Givati Brigade (Israeli Marines), or form an independent armed service branch like the United States Marine Corps. In the earliest day of naval warfare, there was little distinction between sailors and soldiers on a warship. 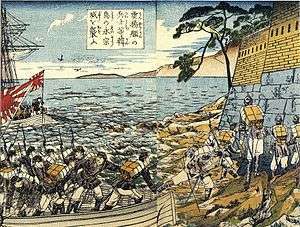 In ancient China, the first well-known naval battles took place during the Warring States period (481–221 BC), where kings ruling regional states battled against one another. Chinese naval warfare in this ancient period featured grapple-and-hook, as well as ramming tactics with ships called "stomach strikers" and "colliding swoopers". It was written in the subsequent Han dynasty that the Warring States Era Chinese had employed ge chuan ships (dagger-axe ships, or halberd ships), thought to have been a simple description of a ship manned by marines carrying dagger-axe halberds as personal weapons to defend their ship. In the west the oarsmen of Ancient Greek and Roman ships had to be capable of fighting the rowers of opposing ships hand-to-hand; though hoplites began appearing on Greek ships specifically for the boarding of enemy ships. The Roman Navy's two fleet legions, I Adiutrix and II Adiutrix, were among the first distinct naval infantry units. The first organized corps of marines was created when the Spanish king, Carlos I, first assigned the naval infantry of the Compañías Viejas del Mar de Nápoles (Naples Sea Old Companies) to the Escuadras de Galeras del Mediterráneo (Mediterranean Galley Squadrons) in 1537, progenitors of the current Spanish Navy Marines (Infantería de Marina) corps. Marines of Italy was created as Fanti da Mar in 1550 in the Republic of Venice. 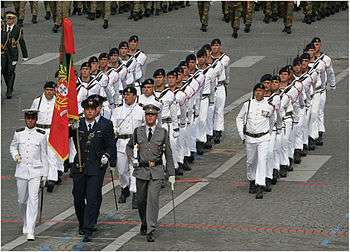 The third oldest marine corps in the world was founded as the Terço of the Navy of the Crown of Portugal in 1618, predecessor to the modern Portuguese Marine Corps. The word marine is from the English adjective marine, meaning of the sea, via French marin(e), of the sea from Latin marinus ("of the sea") itself from mare ("sea"), from Proto-Indo-European *móri ("body of water, lake") (cognate with Old English mere ("sea, lake, pool, pond"), Dutch meer, German Meer, all from Proto-Germanic *mari). The word marine was originally used for the forces of England and exact one-word translations for the term do not exist in many other languages except for the Dutch word marinier. Typically, foreign equivalents are called naval infantry or coastal infantry. In French-speaking countries, two phrases exist which could be translated as marine, troupes de marine and fusiliers-marins; similar pseudo-translations exist elsewhere, e.g., Fuzileiros Navais in Portuguese. The word marine/marina means "navy" in many European languages such as Dutch, French, Italian, German, Spanish, Danish and Norwegian. U.S. Marines conducting a live fire training exercise aboard an amphibious assault ship. The principal role of marine troops is military operations in the littoral zone, operating from ships they are trained to land on and secure key points to around 50 miles inland, or as far as ship borne logistics can provide. As well as amphibious operations, marine troops are also used in a variety of other, naval roles. Stationed at naval bases or forming marine detachments onboard naval ships, they also conduct small scale raiding, maritime boarding operations, security of naval vessels and bases, riverine and coastal missions, mess duty, and field day operations. In addition to their primary roles, they also perform other tasks, including special operations and land warfare, separate from naval operations; ceremonial duties and miscellaneous other tasks as directed by governments . The Bolivian Naval Force includes about 2,000 naval infantry personnel and marines. These are organised in the Almirante Grau Battalion, located at Tiquina on Lake Titicaca, and smaller units. 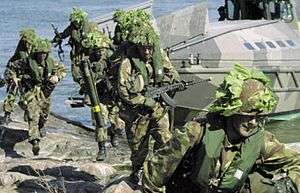 The Finnish Uusimaa Brigade (Swedish: Nylands Brigad) in Ekenäs is the home of the Finnish Marines, under the auspices of the Finnish Navy responsible for training the Coastal Jaegers. The Brigade is the only Swedish-speaking unit within the Finnish Defence Forces. The Fusiliers Marins (Naval Fusiliers) and Commandos Marine (Naval Commandos) are naval personnel. The fusiliers marins protect vessels and installations, provide the navy with military training, augment boarding-landing parties and support operations of the Commandos Marine. The Commandos Marine (Naval Commandos) are a six company Commando formation whose roots can be traced to the Second World War. The Commandos Marine have evolved to be broadly comparable to the British Special Boat Service, with whom they exchange officers. Troupes de Marine ("Marine Troops"), are a branch of the French Army renamed from the Troupes Coloniales who served on Frances overseas territories to maintain or expand French interests. 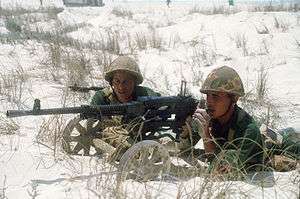 Troupes de Marine are the only units of the French Army to have units permanently based in Africa, one battalion in Senegal, one battalion in Côte d'Ivoire (until 2009, now forming the core of Operation Unicorn), and one battalion in Gabon; in addition they man bases in the French Overseas Territories. The Troupes de Marine include infantry (Infanterie de Marine), paratroops, light cavalry and artillery (Artillerie de Marine). They now provide the large ground combat elements of French amphibious task forces and are specifically trained for that purpose. The 9th Marine Brigade (9e Brigade Légère Blindée de Marine (9 BLBMa)) is twinned with the 3 Commando Brigade of the Royal Marines, organising the exchange of officers and sharing training and exercises. 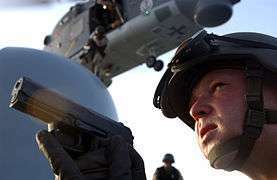 The Marineschutzkräfte (Naval Protection Force), is responsible for the protection of naval bases and facilities and can also conduct small scale landings. The battalion is based in Eckernförde and is organized into five units: one staff & support company, three infantry companies and an intelligence section. The Indian Navy has platoons of amphibious soldiers, similar to the United States Marine Corps, except that they are incorporated into the navy instead of being a separate armed service. The Indian Navy has an elite special operations unit called "MARCOS" (Marine Commandos). They form a special/covert operations and counter-terrorism unit specialising in sea, air and land warfare. Also, they provide support to Indian Army units in specialised areas, such as preventing infiltration in Jammu and Kashmir's Wular lake. This unit was established in 1986, and is reputed to have a strength of 2000 personnel. The Indonesian Marine Corps was formally a special operations force for the Indonesian Navy (TNI-AL), then named Korps Komando Operasi or "KKO" (Commando Operations Corps). It was actively involved with the Singapore confrontation and Malaysian confrontation (The term confrontation was used to prevent the declaration of war) Singapore Confrontation with Indonesia. The Indonesian Marine Corps maintains a joint special operations unit, known as Detasemen Jala Mangkara or "DENJAKA" (Jala Mangkara Detachment) created on the 1st of December 1984, and draws operators from the Komando Paukan Katak, TNI-AL or "KOPASKA" (The Indonesian Navy's Frogman Commando Force) and Batalyon Intai Ampibi, TNI-AL or "YONTAIFIB" (Amphibious Reconnaissance Battalion, Indonesian Marine Corps). This unit has conducted anti piracy and hostage rescue operations in the current pirating in Africa. The Indonesian Marine Corps maintains a special operations unit designated Batalyon Intai Amphibi, TNI-AL or "YONTAIFIB" (Amphibious Recon Battalion, Indonesian Marine Corps). Formerly, this unit was designated Komando Intai Para Amfibi or "KIPAM" (Amphibious Recon Command); the unit was down sized to a battalion level due to the creation of "DENJAKA". This unit is modeled on the United States Marine Corps' Force Reconnaissance units. Its primary function is deep reconnaissance operations and direct action (D.A.) in amphibious assault operations before assault of the main force. The unit's counterpart from the Indonesian Navy is Komando Pasukan Katak, TNI-AL or "KOPASKA" (Frogman Commando Force) established on 31 March 1962 (unofficially 1954). It was modeled on and created with assistance from, the United States Navy's Underwater Demolition Teams (U.S. Navy U.D.T.s), the predecessor of today's U.S. Navy S.E.A.L. teams. Since the Iranian Revolution in 1979, the number of marines in the Islamic Republic of Iran Navy (IRIN) has expanded to 2,600 personnel, in two marine brigades, each composed of three battalions. Their mission is to provide security throughout the Arabian Sea and free waters, as well as securing routes for Iranian ships in the Gulf of Aden. 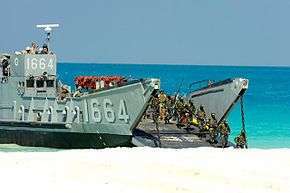 The Navy of the Iranian Revolutionary Guard Corps (IRGCN) maintains several units which may perform marine-type functions, including at least one 5,000 man brigade of three or four marine battalions. It also has a Takavar naval commando battalion, called Sepah Navy Special Forces (S.N.S.F.). They are tasked with providing security in the Persian Gulf and Strait of Hormuz, as well as conducting anti-piracy missions to assist Iranian ships. The Republic of Korea Marine Corps is the marine corps of the Republic of Korea. Though theoretically it is under the direction of the Chief of Naval Operations, the Marine Corps operates as a distinct arm of the South Korean forces, unlike most other marine branches, which generally operate as part of the country's navy. It was founded as a reconnaissance force just prior to the start of the Korean War. The ROKMC has seen action in several major conflicts. The Mexican Naval Infantry (Spanish: Infantería de Marina) of the Mexican Navy consists of 40,000 marines spread in a brigade of three battalions, plus a battalion attached to the Presidential Guard Corps, three regional battalions with headquarters in Mexico City, Acapulco and Veracruz, and thirty-five independent companies (mainly In Celaya) and detachments distributed among ports, bases and zonal headquarters. The marines are responsible for port security, protection of the ten-kilometer coastal fringe, and patrolling major waterways. The marines have light arms, heavy weapons and armored amphibious vehicles. The Navy ceded most of its riverine responsibilities to the Army, reducing the size of the marine force, and deploying them back aboard ships where they play a vital role in drug interdiction and boarding of suspect vessels in territorial waters. In 2010, the Mexican Marine Corps began undertaking land-based counter-narcotics operations, in large part due to the marines' reputation of being Mexico's most trustworthy and unimpeachable force. The Royal Netherlands Navy naval infantry unit is the Netherlands Marine Corps (Korps Mariniers), founded in 1665 as an infantry regiment to the Dutch Navy. They saw their first amphibious action in 1667 raiding the English coast during the Raid on the Medway. Today, it is a brigade approximately 2300 marines strong, consisting of two marine infantry battalions (plus one infantry company which is stationed in Aruba), one amphibious combat support battalion and one logistical battalion. The Dutch Marine Corps is an elite light infantry unit, operating as a rapid-reaction force, deployable anywhere in the world within 48 hours. Dutch Marines train in all possible geographical and climate conditions for their role. Enlisted marine recruit training lasts 33 weeks, and marine officers train up to 18 months (including naval academy time). 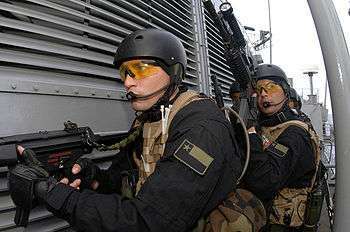 It has its own Special Forces branch known as Maritime Special Operations Forces (MARSOF); including a smaller elite Counter Terrorism (CT) unit: the Unit Interventie Mariniers (UIM) of roughly 130 operators. The UIM is the Netherlands main counter terrorism unit and upholds a reputation as one of the best of its kind, globally. The Pakistan Marines division of the Pakistan Navy was re-established on April 14, 1990, with about 6000 men and plans to expand the force significantly by 2015. The marines are based at PNS Qasim naval base. The Paraguayan Marine Corps (Cuerpo de Fusileros Navales) is a battalion-sized organization consisting of four company sized brigades. In limited cadre form the Marine Corps dates from the late 19th century, although it only achieved significant existence when the three-battalion sized Regimiento de Infanteria de Marina Riachuelo was created in the final stages of the Chaco War of 1932-35. 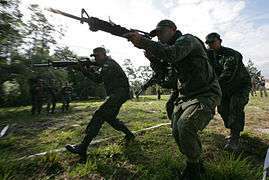 The Philippine Marine Corps (PMC) has a strength of about 8,700 men divided into three brigades. The Philippine Marine Corps is considered the shock force of the armed forces and is the first unit to be involved in any amphibious or seaborne clashes. A Russian Naval Infantryman on exercise. Spanish Navy Marines deploying from an AAV-7 amphibious armoured personnel carrier. The Spanish Navy Marines (Infantería de Marina) are the oldest existing marine force in the world, as they were established on February 27, 1537, by Charles I when he permanently assigned the Compañías Viejas del Mar de Nápoles (Naples Sea Old Companies) to the Escuadras de Galeras del Mediterráneo (Mediterranean Galley Squadrons). Their red trouser stripes mark the Infanteria de Marina as part of the Royal Household Corps, an honour only shared with the Royal Guard, and were given by Charles III to the marines in reward for their fierce defence of the Castillo del Morro of Havana, Cuba against a British expedition in 1762. Naval Patrolmen are naval infantry units of the Sri Lanka Navy. They may be 2-3 battalions strong. These units were formed primarily as a protective force for base and port security, but have since been trained and deployed for amphibious and land combat operations. In addition to being equipped with light arms, the patrolmen have 60mm, 82mm mortars and operate Unibuffel light armoured vehicles. In November 2016, Sri Lanka announced the formation of a marine corps (based on the US Marine Corps) under the Sri Lanka Navy. Syrian Marines before the Battle of Bashura (2016), Latakia Governorate, Syria. The Fouj Al-Mughawayr Al-Bahir (Arabic: فوج المغاوير البحر‎‎, meaning "Marines Regiment") is a unit based in Latakia Governorate. It has participated in operations in the Syrian civil war. The Royal Marines (RM) were formed in 1664 and are part of HM Naval Service. Apart from musicians, they have the longest basic infantry training in the world (the All Arms Commando Course) which stands at 32 weeks for an enlisted recruit and 64 weeks for an officer cadet. They include an expeditionary brigade (3 Commando Brigade RM, which includes commando-trained units and individual personnel from the British Army, Royal Navy and Royal Air Force), a naval security unit responsible for guarding Britain's naval nuclear weapons and other security duties (43 Commando Fleet Protection Group Royal Marines), a landing craft and boat-training group which is also a parent unit for three landing craft units deployed on amphibious warfare ships; and a naval musical branch (the Royal Marines Band Service). The RM has close international ties with allied marine forces, particularly the United States Marine Corps and the Netherlands Marine Corps/Korps Mariniers. "Marine" is also used as a rank in the Royal Marines, being equivalent to an army private. Their motto is "Per Mare, Per Terram", which is "By Sea, By Land" in Latin. The Royal Marines Reserve (RMR) is the volunteer reserve force used to augment the regular Royal Marines in times of war or national crisis. 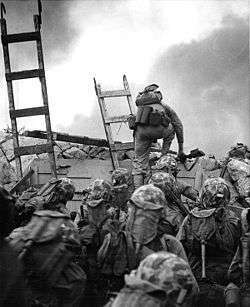 A U.S. Marine scaling the seawall at Inchon, 15 September 1950, during the Korean War. The United States Marine Corps (USMC) is currently the largest and only marine combined-arms force in the world. It is responsible for the majority of the United States of America's maritime expeditionary operations. Created in 1775, it was originally intended only to guard naval vessels during the American Revolutionary War. While the USMC is a component part of the US Department of the Navy in the military command structure, it is a separate military branch from the United States Navy, with its own representative on the Joint Chiefs of Staff. The corps’ major roles include, defense of naval bases, amphibious operations, and land warfare. It also conducts maritime boarding operations and operates its own aviation units mainly to provide air support to the rest of its forces. In addition, it also has other missions. These include, among others, providing personnel as security guards at U.S. diplomatic missions throughout the world, and providing helicopter transportation for the President of the United States aboard Marine One, as well as for other VIPs. Its motto is Semper Fidelis, which means "always faithful" in Latin. The 12th Naval Infantry Brigade (12. Bataljun Mornaričko Desantne Pješadije) of the Yugoslavian Navy consisted of 900 to 2,000 men in three battalions. A multi-ethnic unit, the brigade was broken up during the dissolution of the Yugoslav federation and saw little action. ↑ "Historia de La Infanteria de Marina" (in Spanish). Spanish Navy Marines. Retrieved 7 February 2010. ↑ English, Adrian J. C. Armed Forces of Latin America. pp. 36–44. ISBN 0-7106-0321-5. ↑ English, Adrian J. C. Armed Forces of Latin America. p. 83. ISBN 0-7106-0321-5. ↑ English, Adrian J. C. Armed Forces of Latin America. pp. 177–178. ISBN 0-7106-0321-5. ↑ "Archived copy". Archived from the original on 2012-02-04. Retrieved 2012-01-24. ↑ "Archived copy". Archived from the original on 2015-04-29. Retrieved 2015-04-26. ↑ http://thediplomat.com/2016/01/japans-elite-amphibious-assault-force-trains-with-us-marines/|"Japan's Amphibious Rapid Deployment Brigade"
↑ English, Adrian J. C. Armed Forces of Latin America. pp. 355 & 356. ISBN 0-7106-0321-5. ↑ "US Marines train recently formed SLN Marine Corps". Retrieved 2016-11-23. ↑ [www.navy.lk/eventnews/2016/11/24/201611241610/ "Sri Lanka Navy and US Marine Corps personnel engage in a series of training exercises"] Check |url= value (help).